When you're working in medical environments, it's important that you use gloves you can trust. 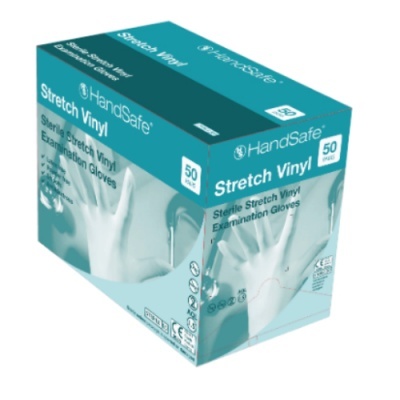 The Hand Safe GS124 Sterile Stretch Vinyl Examination Gloves (Pack of 50) are sterile and dependable, making them ideal for use in a range of medical applications. The flexible material of the gloves helps reduce fatigue during extended wear for an improved fit and feel. This tests the gloves to ensure they protect you against liquid penetration and micro-organisms. These particular Hand Safe GS124 Gloves received an AQL rating of 1.5, meaning that they obtained a performance level one in this area. ASTM F1671-7 tests whether the gloves are resistant against penetration by blood-borne pathogens. 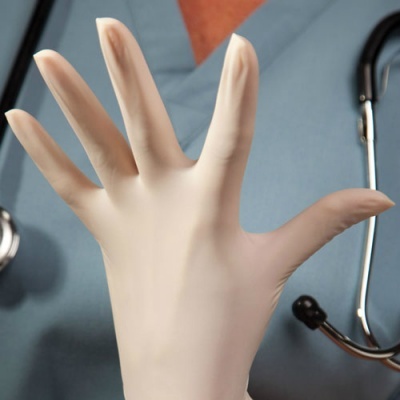 No visual penetration was found with the Sterile Stretch Examination Gloves. This test measures whether the gloves are safe to come into contact with food. The Hand Safe GS124 Gloves are suitable to do so. The Sterile Stretch Examination Gloves are designated Category I gloves, meaning they're suitable for tasks with minimal risks. As such, they should not be used when higher risk hazards are present. The GS124 Vinyl Examination Gloves are available in four sizes to provide you with a fit that's more tailored to your needs. To find out which size you require, please measure your hand across the widest part of your palm and consult the table below. The Hand Safe Examination Gloves have a minimum length of 240mm.